Over the past few years, carrot cake has become my favorite cake on the planet. I love that it’s packed with spices, super moist, full of incredible flavor and plenty of texture thanks to carrots, coconut, raisins and nuts. 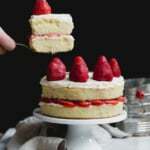 As most of you know, I LOVE baking cake recipes for special occasions: paleo chocolate cake, tahini chocolate chip cake and my strawberry shortcake cake are just a few of my favorites. 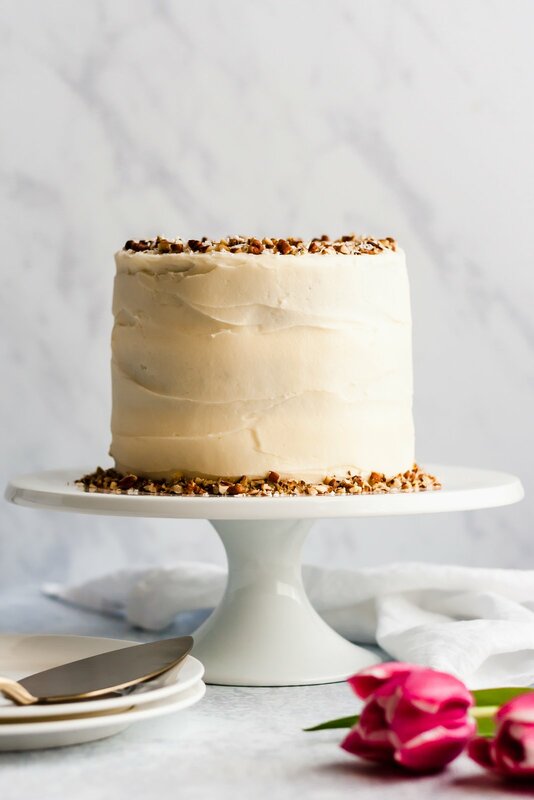 So I thought to myself, why not make a healthier, paleo-friendly and gluten free carrot cake that’s absolutely perfect for spring time and especially Easter. To make it healthier, I used natural unrefined sweeteners, gluten free flours and a few other special ingredients to make it absolutely amazing. Almond flour: I recommend using a fine blanched almond flour. Make sure you pack the almond flour. Coconut flour: this is a great gluten free flour to help absorb moisture in recipes and also add fiber and nutrition. No need to pack the coconut flour though. 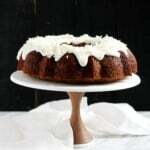 Finely shredded unsweetened coconut: in my opinion, this cake requires shredded coconut for texture. I haven’t made it without the shredded coconut so please don’t skip it, it’s crucial for texture. 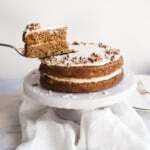 Spices: no carrot cake is complete without the addition of cinnamon and a little nutmeg. Vanilla extract: just an essential. Eggs: this recipe uses four eggs to help with consistency and texture. I’ve added some notes below if you’re interested in making this vegan. Pure maple syrup: WOW is all I can say. The maple syrup is just a nice touch to this recipe and adds so much flavor and additional moisture. Tahini: while it’s only a small amount, the tahini is crucial to the recipe. I think you can add almond butter or cashew butter instead but tahini is INCREDIBLE and has a unique drippy texture unlike other nut butters. Just trust me and make the cake as is! Coconut oil: If you don’t want to use coconut oil, you can always use melted butter. Almond milk: any dairy free milk will work. Carrots: this recipe uses 3 cups of grated carrots! I like small or medium grate for my carrot cake recipes. You need a few essential kitchen tools for this recipe including: 6 inch cake pans, parchment paper, an offset spatula for the frosting, a good set of mixing bowls and a nice cake stand. Make sure you follow the directions as written, and wait until the cakes are completely cool before frosting them. After they are frosted, I recommend storing carrot cake in fridge for optimal freshness. Use medium grated carrots. You can grate the carrots in your food processor with the grated blade, or you can use a hand grater. Do a crumb coat for the frosting first. Frost the layers as you normally would and then coat the outside of the cake with a very thin layer of frosting then place in fridge for 10-15 minutes before you finish frosting. This is so that the crumbs stick to this layer of frosting and not your main layer. You can make this cake 1-2 days ahead of time and it will still be absolutely delicious! To make this cake paleo, simply use a dairy free cream cheese and a paleo friendly powdered sugar option. You can also use Simple Mills frosting. 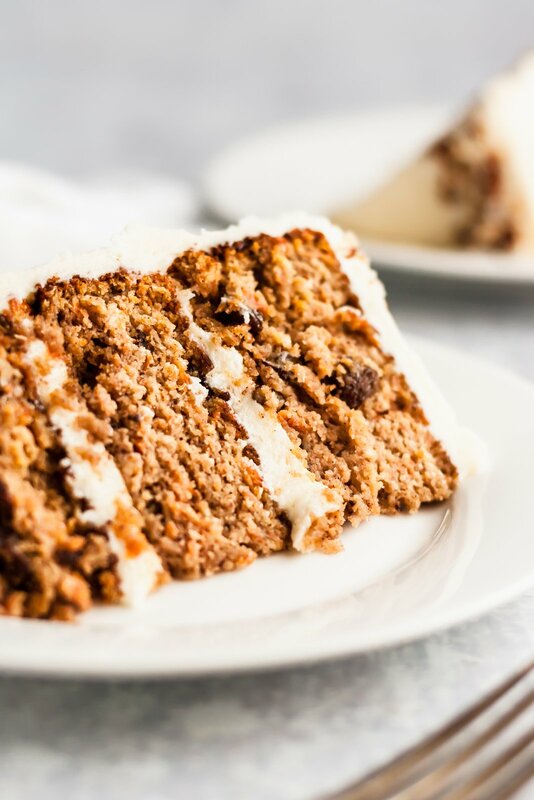 I know you’re going to love this healthy gluten free carrot cake, please let me know if you make it by leaving a comment and rating the recipe below. I’d love to hear from you and it helps encourage others to make the recipe too! xo. P.S. 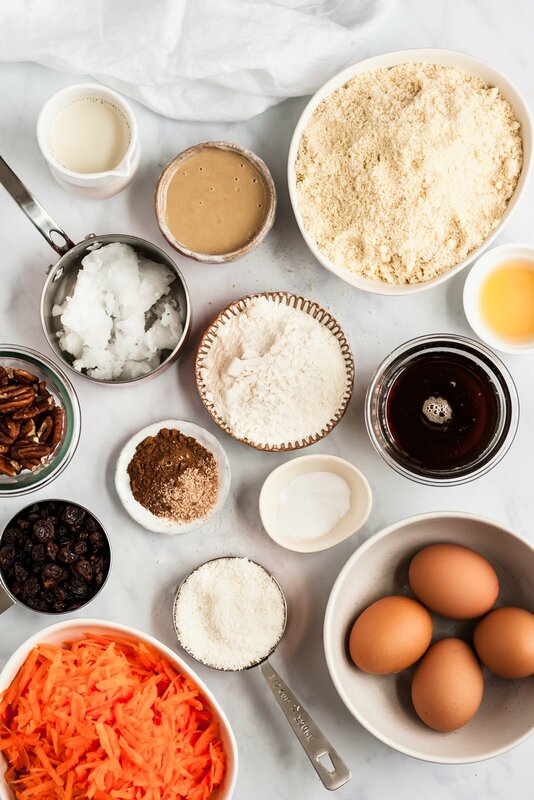 feel free to listen to my cinnamon carrot cake playlist on spotify while you bake this! 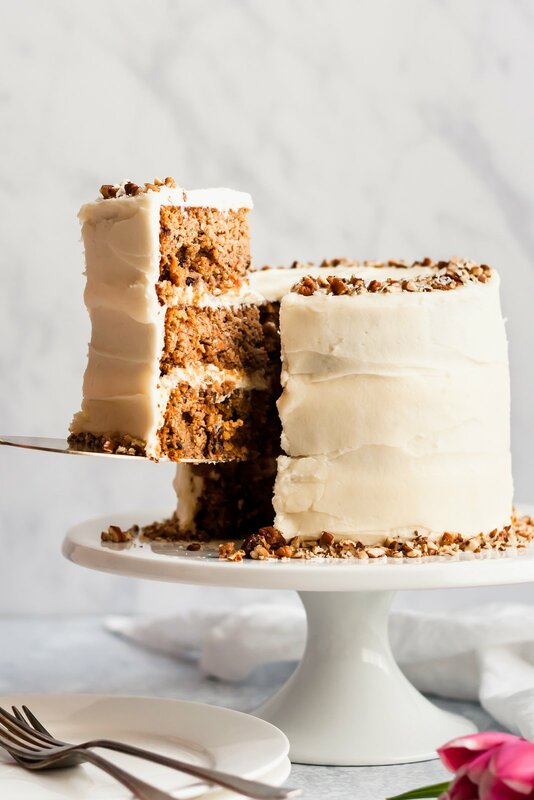 The BEST moist healthy carrot cake you'll ever eat made with almond and coconut flour and naturally sweetened with pure maple syrup. 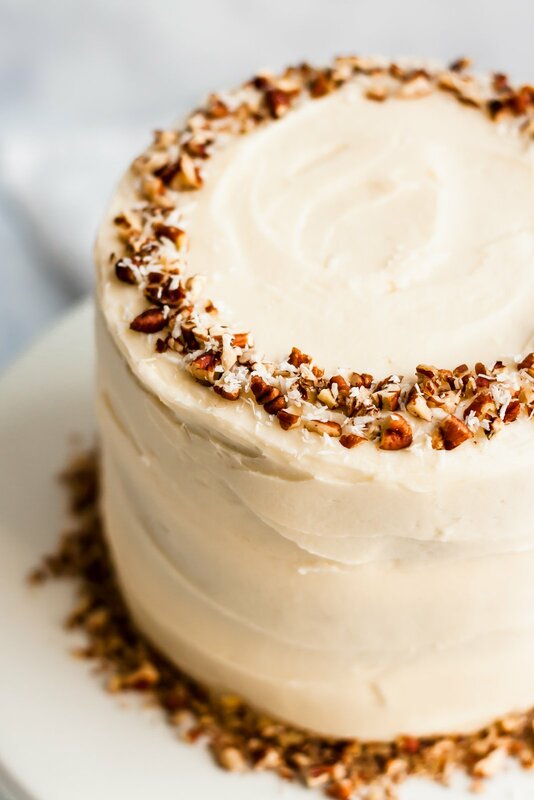 Packed with coconut, raisins and pecans and topped with a delicious cream cheese frosting that's easily dairy free! This paleo-friendly gluten free carrot cake will be your new favorite carrot cake recipe. Preheat oven to 350 degrees F. Line the bottom of three 6-inch round cake pans or two 8-inch round cake pans with parchment paper rounds. Spray parchment paper and sides of pan with nonstick cooking spray. YOU SHOULD USE PARCHMENT PAPER or the cake is likely to stick. Please do not forget. In a large bowl, whisk the almond flour, coconut flour, unsweetened shredded coconut, baking soda, cinnamon, nutmeg and salt together. Set aside. In a large bowl, whisk together the eggs, pure maple syrup, tahini, almond milk, vanilla extract until smooth. Slowly whisk in the melted and cooled coconut oil until it’s well incorporated, the stir in the carrots. Note: It is important that your eggs are at room temperature otherwise the coconut oil with coagulate. The coconut oil should be melted but not HOT, but rather closer to room temp. Add dry ingredients to wet ingredients and mix with a wooden spoon until well combined. Stir in raisins and nuts, if using. Divide batter evenly between pans and spread out with a spatula to smooth the tops. Bake for 22-32 minutes in the two 8-inch pans and 30-40 minutes for three 6-inch pans. Cakes are done when a tester comes out clean or with just a few crumbs attached. Allow cake to cool completely before frosting or removing from the pans. The cake should be room temperature when you frost it. This is very important. Cakes can be made a day ahead if you’d like. Make your frosting: In the bowl of an electric mixer, add the softened butter and cream cheese and whip on high until light and fluffy. Add powdered sugar, vanilla extract and milk and beat for 2-3 minutes more. Now it’s time to frost the cake: place about 1 tablespoon down onto onto the cake stand and spread out. Invert cake onto the cake stand, add about ½ heaping cup frosting between each layer, repeat with each cake, then frost the top and sides of the cake with the remaining frosting. Decorate cake with pecans and shredded coconut on top. Once you are done frosting, place the cake to the fridge. Cake will stay good for 5-7 days in the fridge, and should be covered to ensure freshness. Serves 16. To make dairy free/paleo: use vegan butter (I recommend Earth Balance) and a dairy free cream cheese such as Kite Hill. You may also need to use a paleo powdered sugar. You can also use Simple Mills Frosting as an alternative. To make vegan: I haven't tried making this cake vegan, but if you want to try you can use 4 flax eggs (4 tablespoons flaxseed meal + 12 tablespoons water). 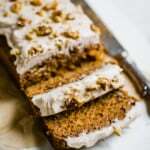 92 Responses to "The Best Healthy Carrot Cake You’ll Ever Eat (gluten free & paleo-friendly!)" I looooove carrot cake and this looks amazing! Will this recipe Work for cupcakes? I think so, although I would probably suggest using 1 teaspoon baking powder and 1/2 teaspoon baking soda. Plus I would recommend adding 1 teaspoon vinegar to the recipe (this is all to help them rise a bit). I’m not sure on baking time, but i would guess 15-20 minutes. All of your paleo recipes look so great, but my mom is allergic to almonds. Do you think a hazelnut flour or something could work? Or do you think that would ruin the flavor and texture? I find that subbing hazelnut flour in recipes in high amounts messes with the flavor! Hazelnut flour would definitely work here, but yes, the cake will taste like hazelnuts. Another option is to use pecan flour, which would be delish and help keep the flavor in tact better. Honestly I couldn’t tell there was coconut in here at all. I use the Bob’s Red Mill finely shredded unsweetened coconut and it is amazing. If you want to omit, I suggest adding a tablespoon or two of additional coconut flour — but again, please know I haven’t tested it any other way than written. 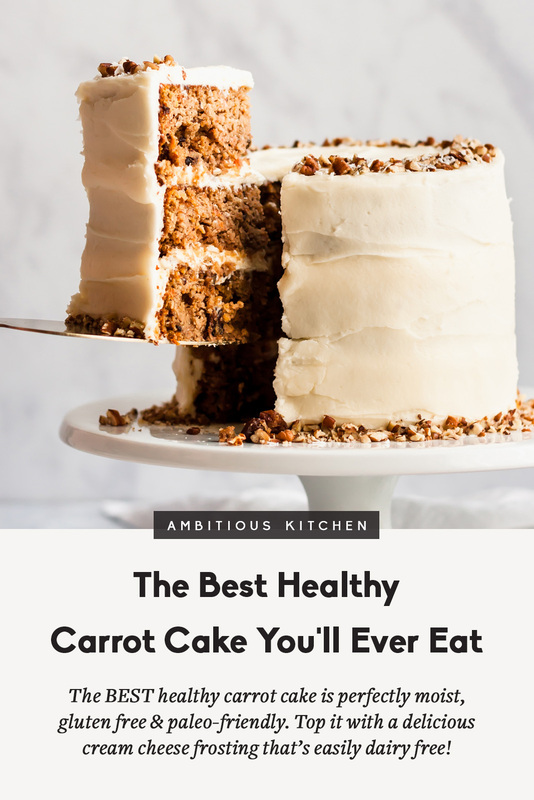 I looooove carrot cake – and love this healthier take. One of the things I loved from my mom’s carrot cake was the addition of crushed pineapple. But this would add more moisture (her cake also had like a cup of vegetable oil) could you add pineapple here without adjusting the wet ingredients you think? That’s tough. I did try it with pineapple and felt like it was *too moist* but if you decide to add pineapple, I might suggest draining it COMPLETELY and reducing the almond milk to 2 tablespoons instead of doing 1/4 cup. please let me know how it turns out! Amazing!! Let me know what you think of this one 🙂 excited to hear! Could I sub the powdered sugar in the frosting for lankanto’s powdered monkfruit sweetener? I haven’t tried it but I think if it’s similar to powdered sugar than it would probably work. This is a STUNNER. Nice work, friend! Oh my gosh, this looks absolutely amazing!!! Mouth watering! Thanks Kelli!! It’s SO delicious. Looks delicious! I can’t use but ingredients due to an allergy. Any thoughts on what to replace the almond flour with? Thanks! Hi! Unfortunately I don’t have a substitution for this cake. I made this cake yesterday. I did all in one square pan. Omg….this is THE BEST carrot cake I’ve ever had…girl….amazing…. Another super duper perfect recipe from you…. Amazing! Glad to hear it works out in a square pan. So happy you loved it! Can I bake the cake in a 9×13 ? Also can I substitute the tahini with apple sauce? Yes you can bake it in a 9×13 inch pan. I would check it around 30 minutes, but it could take up to 45 minutes. I would not sub the tahini with applesauce because I think it would add too much moisture. Instead try almond or cashew butter. Hi! Is the coconut flavor prominent? Im cooking this for my boyfriend but he doesn’t like coconut very much. Thanks! Hi! I don’t think it is at all. It more tastes like a spice cake! Made this and loved it! The cake is not overly sweet and pairs perfectly with the frosting. I divided the recipe in half and baked in a loaf pan for 35 min and it came out perfectly! I also used peanut butter instead of tahini (because I didn’t have any on hand) and didn’t taste at all like peanut butter. Great recipe! This was a crowd pleaser for sure! 🙂 Best cream cheese buttercream ever! Do you think you could sub the coconut flour for oat flour? If you want to sub oat flour in for the coconut flour, I think it’s possible. You may need to use just a little more. Looks amazing, can’t wait to make this!! Is it possible to sub almond meal for almond flour? I haven’t tried it, but if you do, just know that it may be a little grainy. Please report back if you try it! Would love to hear. I made this for my husbands birthday. He loves carrot cake. Wanted to find a healthy recipe that would taste good. I’m not a big fan of carrot cake, but this cake has changed my mind. So good. The icing is unbelievable. the instructions state to pack the almond flour like the coconut flour, but then it says that the coconut flour does not need to be packed. I am confused…please help! Hi Kristin! The coconut flour does not need to be packed. Sorry about that. Made it and it turned out perfectly!! Great recipe! Made this cake for my boyfriend’s birthday and it was a huge hit, super moist and delicious! My dad commented that it was the best carrot cake he has ever had. Will definitely make again! So happy to hear that, Emily! Love this one for birthdays (and all celebrations really). Hi again. I do not have coconut flour but loads of almond flour so do I use less almond flour or more liquid? BTW I love all your recipes. Hi! You can try and use oat flour but I’m not certain that will work. You need coconut flour for liquid absorption and to help create a nice crumb for the cake. Hi! I would love to make this recipe for Easter. But I am wondering what kind of paleo powdered sweetener I can substitute the regular powdered sugar for? Thanks! This cake is amazing! I’ve never made carrot cake before, so I was a little nervous. It came together so easily and did not disappoint. I will be making this every Spring now. It is perfect! I’m SO glad you like it! Thank you for leaving a comment, too! Can this stay on the counter top for a couple days or should it be refrigerated? Hi Chelsea, I recommend storing this cake in the fridge after you frost it! im so upset. turned out so flat- in flavour and size. I’m so disappointed and I’m not sure what went wrong. I read every review before hand and watched the video. No substitutions! Hi! I’m sorry you had that issue, especially since everyone else has success with the recipe. I’m curious what pans you used and also if any of your ingredients were old? That’s the only thing I can think of that would be causing an issue. Monique, this is the first time I’ve ever commented on a blogger’s site. 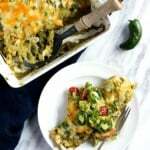 But this time I felt compelled to finally tell you that I have been following your recipes for years and your dishes brings so much joy to my family. My five year old son loves your pumpkin cinnamon rolls and paleo chocolate banana muffins, and my three year old daughter loves all of the sweet potato dishes and salads. I have made this paleo carrot cake two times since you posted it! My husband and I recently took our family to Disneyworld and we packed this cake up for our resort fridge. Thank you for sharing your passion with us. You are in our home weekly through your recipes. I’m super excited to try this recipe. I don’t have a lot if experience baking so sorry for this probably obvious question. I only have 2 9 inch pans. Can you offer any suggestions on doing anything differently? HI – I have the same question! Planning on making this today but with two 9 in pans. Hi! I would not make this cake with two 9-inch pans as I think they would be too thin, however if you do it you’ll need to reduce your baking time. I would check the cakes at 18-22 minutes! I would not make this cake with two 9-inch pans as I think it would be thin, however if you do it you’ll need to reduce your baking time. I would check the cakes at 18-22 minutes. it turned out great – even in 9 inch pans – everyone LOVED IT! Thanks for the inspiration! Is there a way to substitute for the maple syrup? I am diabetic and so avoid all sugars. This was incredible!! Huge hit!! And two of the eaters are super picky allergy-recipe haters, lol. They not only couldn’t tell, but absolutely loved it. I did sub vegan butter (miyoko’s creamery) for the coconut oil cuz wanted less coconut flavor and the c.o. I have is strong in flavor. Otherwise, followed exactly as written. Did both add-ins of pecans and raisins. Oh — recipe didn’t state unless I missed but I did toast the pecans first and that worked beautifully. Both for decorating but the add-in to the batter too. I think it imparts more flavor that way. Will make again!! Thank you so much!!!! Amazing!! So happy to hear that Lori. Love the pecans + raisins in here. Thanks for your comment! THis cake….. is fabulous. Family loved it, I loved it, and wouldn’t even known it was gluten free. Moist crumb, not too sweet (depending on how much sugar you put in the icing) and FULL of flavour. Definitely making this again. Excellent recipe. Thanks. I made this for Easter and it turned out incredibly well!!! I’ll definitely be making this again! This was ABSOLUTELY PHENOMENAL!! I’ve never baked a cake before and this was perfection. Since going gluten and dairy free I’ve missed carrot cake so thank you! Everyone at Easter loved it!! Amazing! My husband loves carrot cake and I made this today for his birthday. It was perfect and I’m making it for him every year! Such an awesome recipe! This cake was perfect for Easter! I used two 9″ cake pans and thankfully it still turned out perfectly moist and not too thin! My mom took a bite and said “this must be a very rich cake!” so she was shocked when I told her how healthy it is. Even a few of my family members who don’t like carrot cake tried a piece because everyone was talking about how delicious it was. 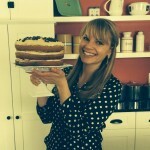 Looking forward to making this and the tahini cake again!